One of the tropes of jungle exploration stories is that, at some point, you’re going to run into a tribe who really don’t appreciate your presence. In Eberron, those tribes often are not human. 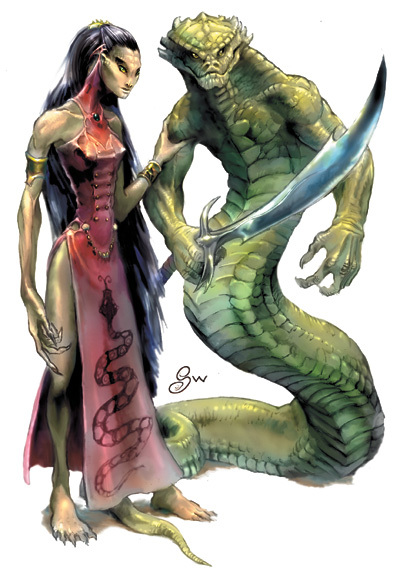 On the continent of Xen’Drik, those tribes are sometimes a disturbing mixture of snake and post-human cultist known as Yuan-Ti. There’s something decidedly Lovecraftian about these wonderful opponents, who worship and adore snakes so much that they have whole rituals around becoming snakes and finding ways of inducing snakiness in others. Those who look the most human are the grunts and lowest orders, with huge snakes with slight human characteristics called Abominations being the highest rank, directing all others. On their way then to the mysterious Giant ruins, the adventurers weighed anchor for the night in the river, only to find that they had annoyed two Abominations that had come down to have a midnight swim. They duly summoned some troops and began to assault the boat, slaying two crew members to draw the adventurers’ attention while their minions climbed on board from the sides and rear. Battle was duly joined, at which point the spellchuckers found out the hard way that the Yuan-Ti are so inherently magical that they have a spell resistance that needs to be overcome. Favoured tactics of druidic lightning calls and wizardly barrages of magic missiles had to be hastily dropped in favour of summoning spells, pyrotechnics to cloud line of sight and as many buffs for the fighters as could be dredged up in a pinch. The Yuan-Ti deployed fear and poison, with archers doing their best to shoot down the druids as they shapechanged into bats to escape Aversion effects cast by the Abominations. All in all, things were looking grim until the initial screen of half-bloods was defeated, clearing the way for Bumperklart to engage with one of the Abominations in hand-to-hand combat. A summoned hippogriff was shot down by Yuan-Ti archers, who were in turn harried by summoned fiendish giant spiders, while summoned dire wolves danced and tripped attackers on the boat’s deck. With the thrust of the Yuan-Ti assault broken, the Abominations dropped Deeper Darkness effects on the battlefield and the tribe fled, with many being cut down in the process. One of the Abominations fell to Bumperklart’s blade, but the other swam away, leaving the group to batten down the hatches to wait for the dawn.